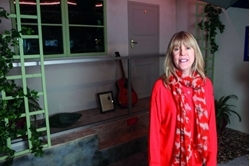 Meet Jenny Boyd, ambassador for The Beatles Story in Liverpool. Beatles Radio: The Beatles, Solos, Covers, Birthdays, News The Fab 4 and More! Jenny Boyd, sister of George Harrison’s first wife, Pattie, and an ambassador for The Beatles Story in Liverpool, tells Abigail Healy her fascinating story. How did you first become involved with The Beatles? It was when my sister, Pattie, began going out with George [Harrison]. We would often all go to the latest nightclubs in London together. Why is now the ideal time for an exhibition about The Beatles in India at The Beatles Story in Liverpool? It’s 50 years since they were in India. That time had such a huge impact on so many people. It was not only their music, but also their influence in bringing the benefits of meditation to the West. How did you end up joining The Beatles’ trip to India in 1968? to accompany them to Maharishi’s ashram in Rishikesh. I had been on my own spiritual path for over a year and India figured enormously. I had longed to spend some time there. It was like a dream come true.